Last week, something really amazing happened. 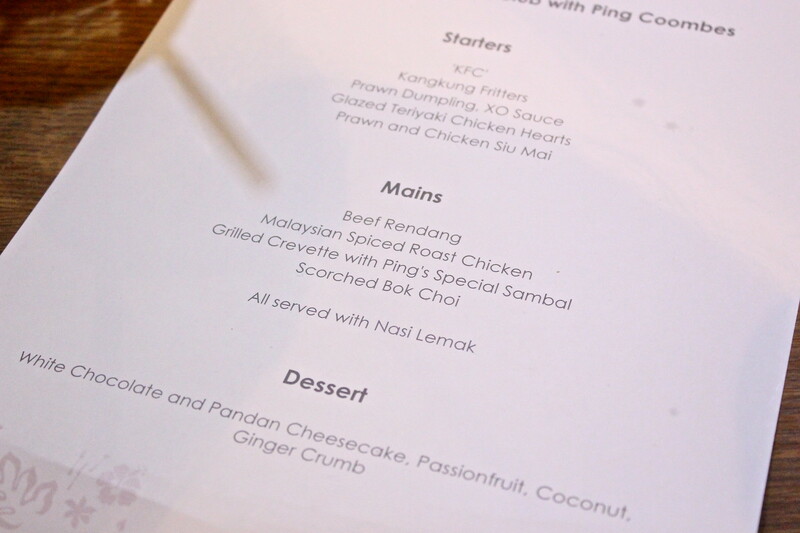 I received an invite to attend a Malaysian Supperclub hosted by Malaysia Kitchen, with dinner cooked by Ping Coombes, the amazing winner of this year's Masterchef, I literally couldn't believe my eyes. Just unreal. 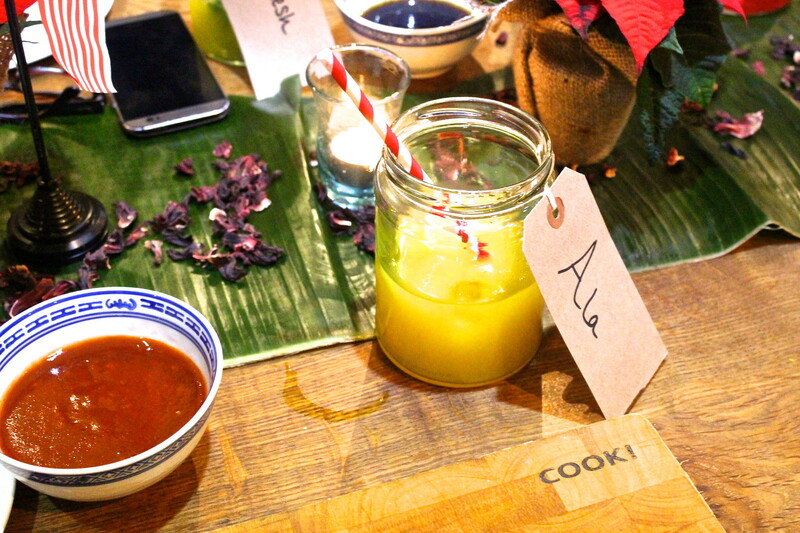 The night was put together in order to help promote Malaysian food in the UK - which to be fair I totally get because I think I've probably only tried Malaysian food once or twice prior to the supperclub. I turned up at the Food at 52 cookery school straight after work, based on the edge of Clerkenwell, just a short walk from Old St station and was greeted with a spread of these fab non-alcoholic cocktails. The cookery school itself is quirky and different. The layout and decor mimics a home, kitted out with an upright piano, books on shelves, sofas and old-fashioned rugs to boot. 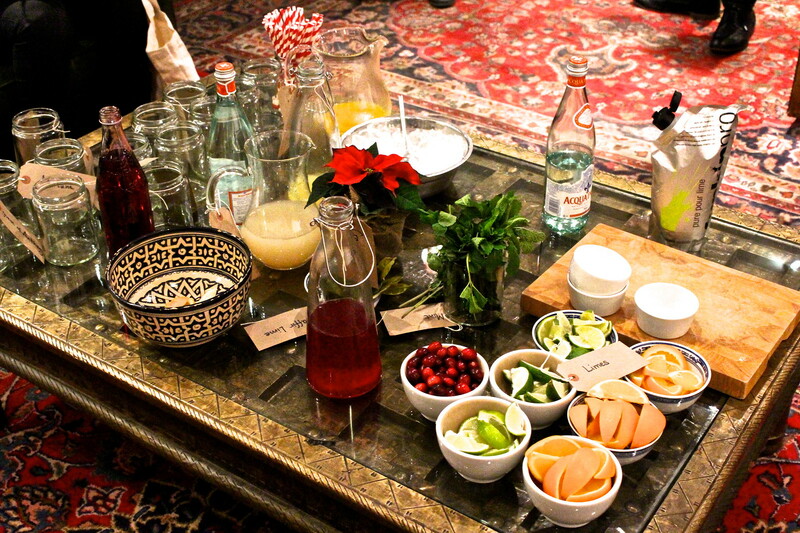 The spread of 'make-your-own mocktail' ingredients was a lovely touch, with choices ranging from mango juice to rosehip cordial - the possibilities were endless. 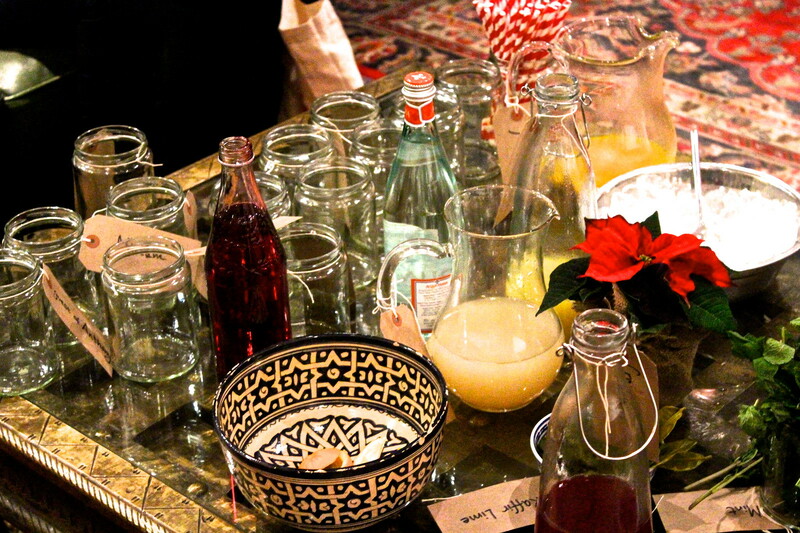 And obviously we all had a mason jar with our names on tags, with stripy paper straws to match. Now I'm not even that into pinterest but EVEN I know that it was a pinterest lovers dream. Soon enough, Ping came upstairs to see if we wanted to help out with making some dumplings for the starters - obviously everyone jumped at the chance to get stuck in and before we knew it we were assembling dumplings like absolute pros! 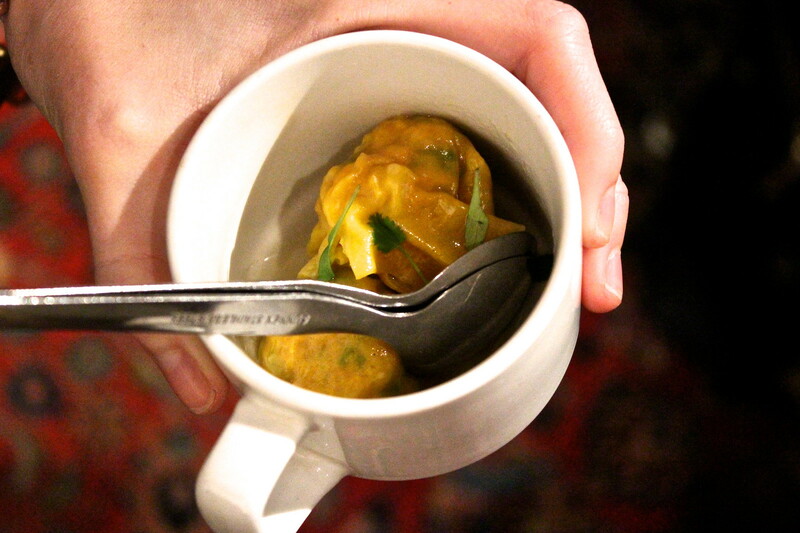 The filling for the dumplings was a chicken and prawn mix with garlic chive, which I have to be honest I'd never heard of but they made some damn good dumplings which we were served back upstairs whilst enjoying more mocktails and mingling amongst the lovely bloggers and guests in attendance. 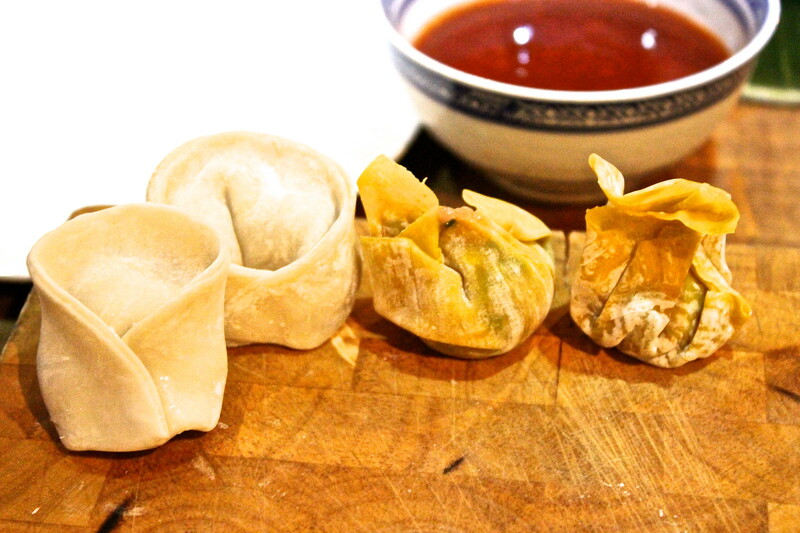 A thank you is in order for Amanda here for modelling those dumplings so damn well in that cup there! Before we knew it we were back downstairs in the kitchen/diner (also with many a homely touch) getting ready to enjoy the rest of the starters, consisting of a whole array of Malaysian goodies. Ping made sure to give us some context into each element of the dinner. I particularly loved her story behind the soft-shell crabs, being something she remembers enjoying as a child. You can really tell she absolutely adores food - and that really shines through the food she serves. 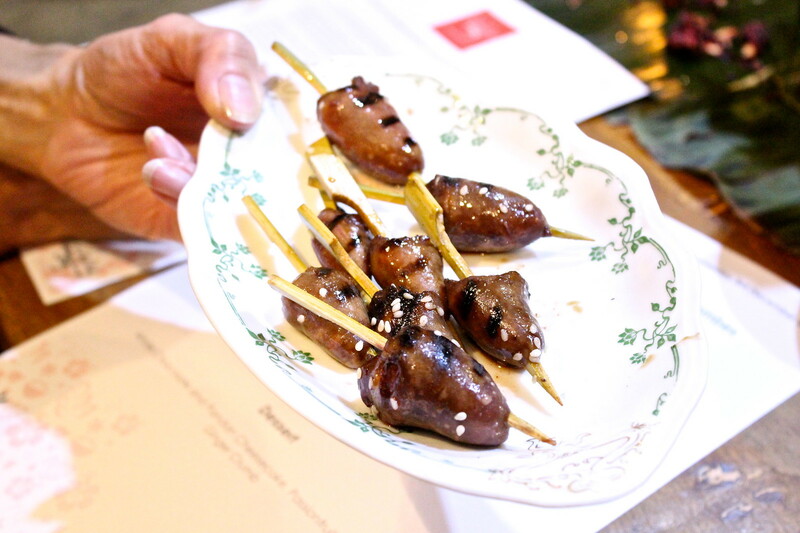 I can't quite believe it myself, but those nugget-looking bites on skewers are chicken hearts... and yes I had one. 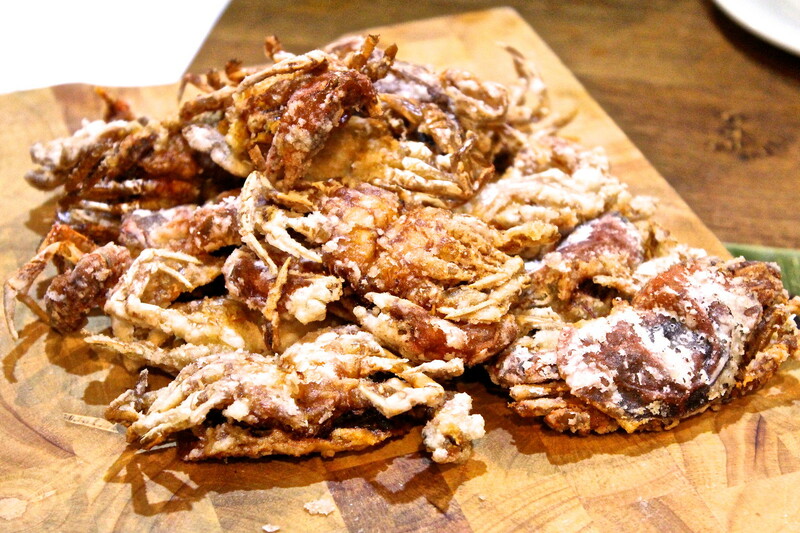 And yes that is also a whole deep fried, soft-shell crab... and yes I also had one of those, legs, claws, the lot. It was delicious. We then moved onto the main, which was a complete delight - a variety of foods, including Ping's winning dish from Masterchef - Nasi Lemak. I have to say, I can't even believe the work that must have gone in to the individual elements of our meal that night but I think everyone in that room would agree that the award should go to Ping's mum - bear with me. 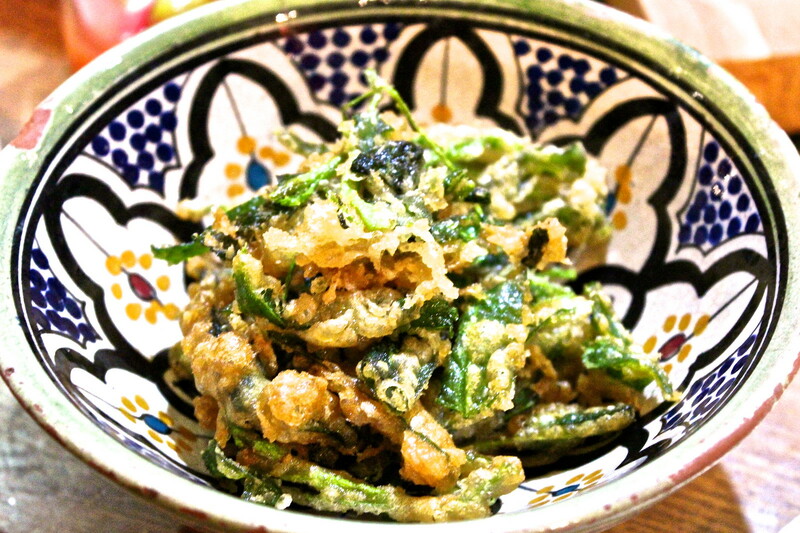 Ping told us that the little crispy anchovies in the main dish, are anchovies that are lovingly gutted, skinned, washed and prepared by Ping's mum and are from her own personal stash. Just wow. If that doesn't tell you how much love and care goes into Ping's food, I don't know what would. 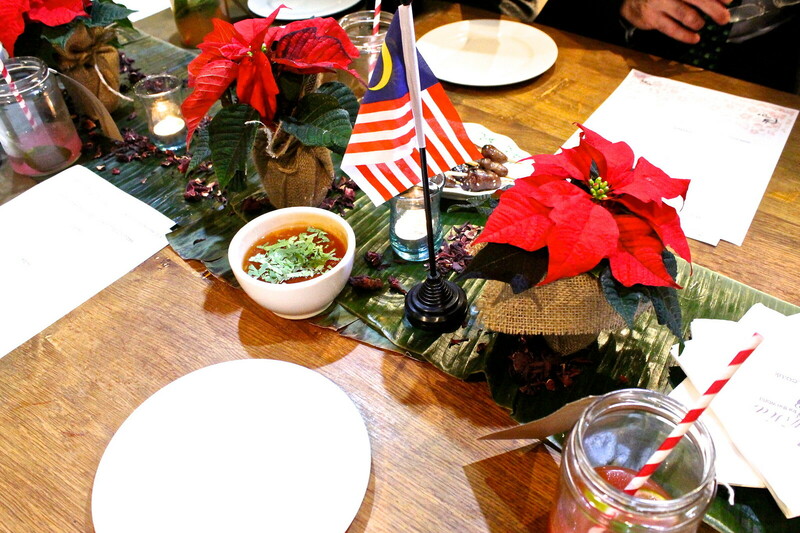 The food itself was bursting with flavour - as I'm sure you'd imagine Malaysian food to be. 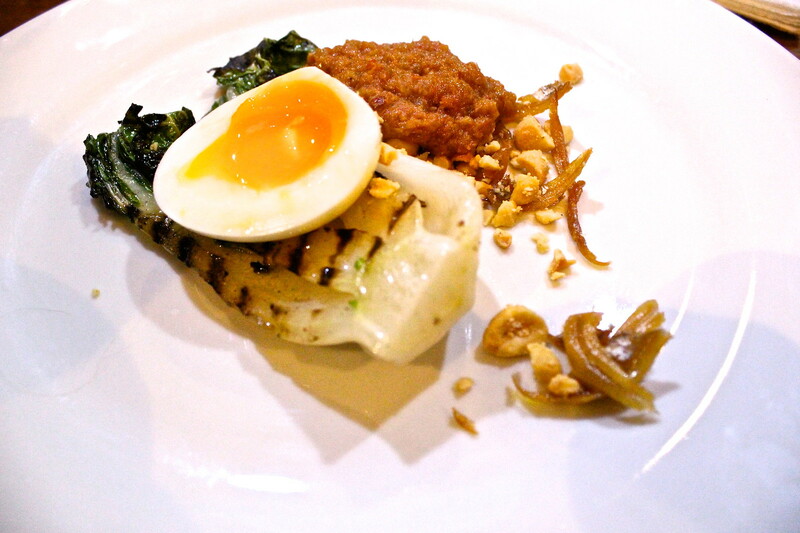 My stand out elements of the main were the roast chicken, the seared bok choi and the nasi lemak itself, but that's not to say the whole meal was amazing, because it truly was. I can't quite describe the flavours, because they're completely unique - I've never tried anything like Malaysian food on this scale before, which is refreshing and exciting all at once. And after a short while, when most of the food had been devoured by the dinner guests, we were ready for dessert. 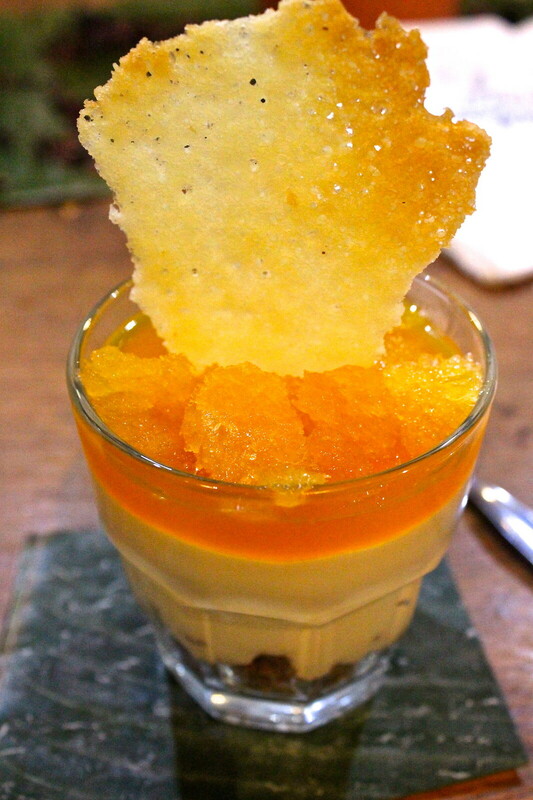 I always considered myself a savoury person with a penchant for sweets but in order to say that the dessert was without doubt the star of the show, I think I have to confess otherwise. Ping, if you're reading, you need to PACKAGE THIS AND SELL IT, because you will make millions. The dessert was absolutely to. die. for. The freshness of the passionfruit flavours married with the smoothness of the white chocolate and (the base base base, the) crumbly biscuit base (it's Masterchef related... I had to) - everyone in the room was genuinely upset when they had finished their dessert. I came away from this night completely and utterly buzzing - with my love of food and cooking at an all time high. For the record, I was rooting for Ping to win on Masterchef - she knocked those guys out of the stratosphere with her dishes - and needless to say Ping is so friendly and lovely as well as being completely humble. What a babe. Thank you so much Malaysia Kitchen for hosting such a superb night, not only was everyone so lovely I got to become that much more acquainted with a cuisine I knew relatively nothing about before! Just excellent. Cream With Your Coffee Cake?